including reviews, interviews, and previews? 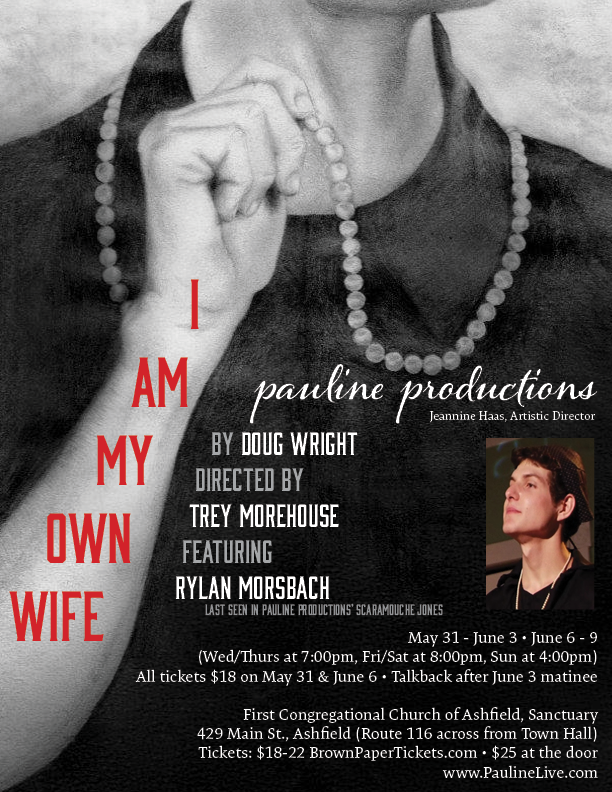 Check out In the Spotlight, Inc.
Rylan Morsbach who wowed audiences with his one-man performance of Scaramouche Jones (2010) returns to Ashfield to perform in Pauline Productions’ (PaulineLive.com) I Am My Own Wife by playwright Doug Wright. This Pulitzer Prize and Tony Award Winning modern classic tells the fascinating true life story of Charlotte von Mahlsdorf, born Lothar Berfelde, who remarkably survived both Nazi Germany and Soviet controlled Berlin as a transgender woman. Actor Rylan Morsbach portrays over 30 characters in this tour-de-force performance as we follow the many threads that make up Charlotte's life. “An experience that is intellectual, theatrical, funny, and poignant…without forgiveness and sentiment [it] unravels the story of one life." NYTheatre.com. 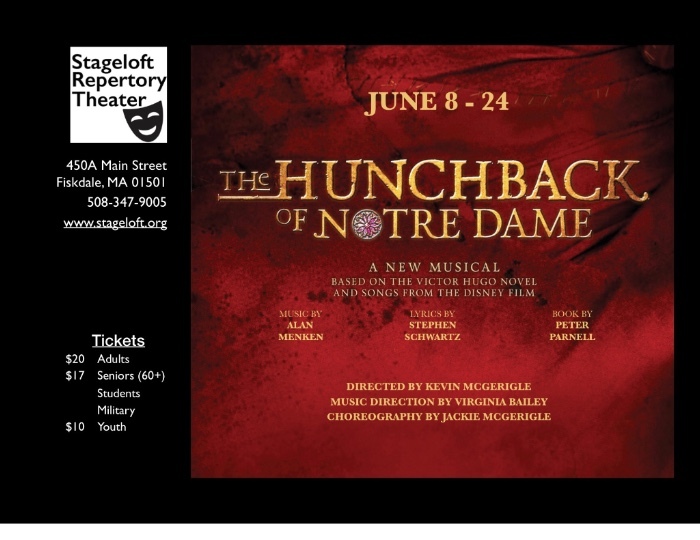 450A Main Street, Sturbridge MA presents THE HUNCHBACK OF NOTRE DAME. 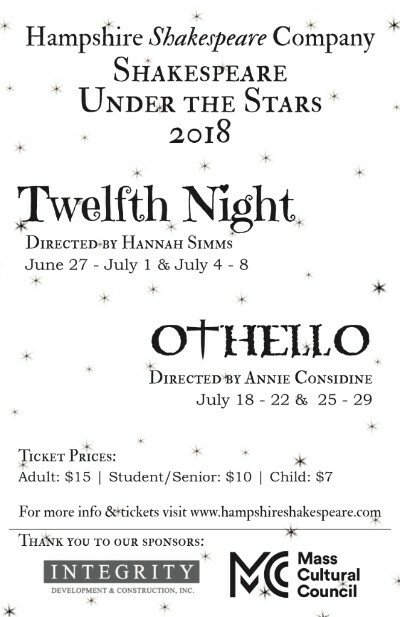 Performances June 14 through June 24, Fridays and Saturdays at 8PM, Sundays at 2PM. This production is directed by Kevin McGerigle, music direction by Virginia Bailey, choreography by Jackie McGerigle. Tickets are $20 adults, $17 seniors/students/military, $10 youth. Groups rates available. For tickets call 508-347-9005 or visit www.stageloft.org. 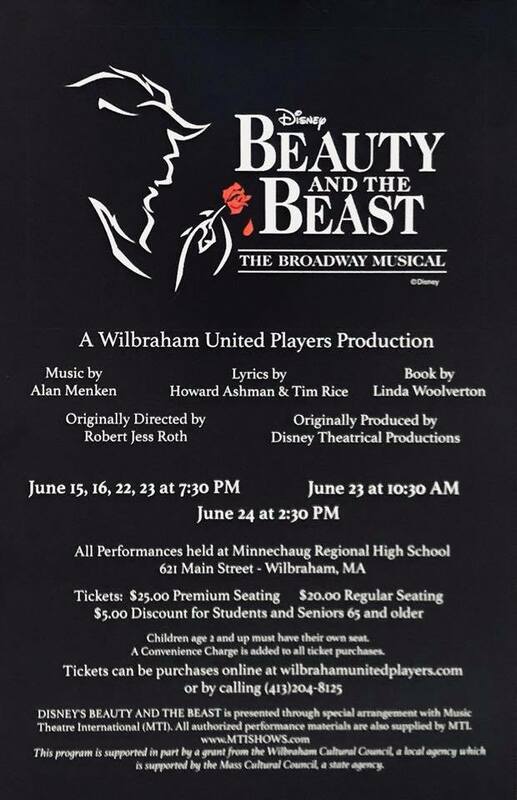 Wilbraham United Players Production of Disney's Beauty and the Beast will be held in the Auditorium at Minnechaug Regional High School in Wilbraham. MA. Tickets are $25 for premium seats, $20 for regular seating. ALL SEATS ARE RESERVED. $5.00 discount for Students and Seniors. Tickets can be purchased through players website. We offer two shows each night at 7 pm and 8:30 pm for five nights only with a limit of 250 participants total. Tickets are $25. SPONSORED BY TEDDY BEAR POOLS AND COHN AND COMPANY REAL ESTATE! For the uninitiated, what is immersive theater? Immersive theater is a brand of performance that puts the audience directly into the world of the show, often in non-traditional spaces and with a higher level of agency than a conventional performance. Unlike "audience participation" moments in more traditional theater, immersive theater audiences are not put on the spot for entertainment purposes so much as invited into the show's universe, where meaningful connections between characters and audience begin to take form. 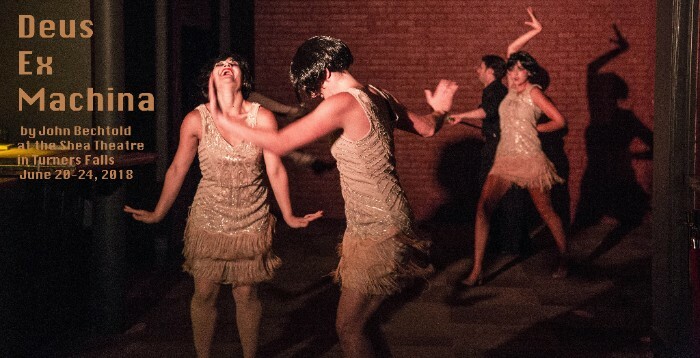 In Deus Ex Machina, audience members will be invited to explore the many corners of the historic Shea Theater, which has been a home for 1920's vaudeville troupes, a controversial 1970's commune called the Renaissance Community, and much more. Though a carefully-curated experience, they will get the chance to play with the ghosts of the building in exciting and sometimes unexpected ways. Indeed, the star of the show is the Shea Theatre, a venue with a long and wondrously checkered past. Denis Shea opened the theatre on Valentines Day 1927. The stage was the home for amateur theater productions put on by such groups as the American Legion Auxiliary, the Rotary Club, and the Turners High School. Mr. Shea also brought in occasional vaudeville shows. He died in 1945 and his family sold the theatre two years later. It continued to operate under various owners until 1956. The Shea then remained dark except for a short time in 1963-64. In 1973, the Renaissance Community bought the Shea and used it as a recording studio and site for their religious activities under the leadership of Michael “Rapunzel” Metelica. In 1986, they sold it to the Franklin County Community Development Corp, who launched the restoration project whereupon the town of Montague bought the property. Most recently, in 2015, a new board of directors took on the lease and restored the building to once again become an active and vibrant community cultural center. The cast of Deus Ex Machina includes Eggtooth regulars and a few new performers: Linda Tardif, Marina Goldman, Reynolds Whalen, Katie Spurgin, Atticus Belmonte, Enzo Belmonte, Pax Belmonte, Amelia Chalfant, Jack Golden, Katherine Adler, Monte Belmonte, Lindel Hart, Lori Holmes Clark, Michayla Robertson-Pine, Emma Ayres, Troy Mercier, Emily Pritchard, Matt Ferrari, Joe Dulude, Deb Banks, and Julia Whalen. South African playwright Athol Fugard’s The Road to Mecca, has been called “a penetrating study of the role of the artist in any society.” Silverthorne Theater continues its exploration of the function of art with this piece that runs June 21-30 at the Hawks and Reed Performing Arts Center in Greenfield. 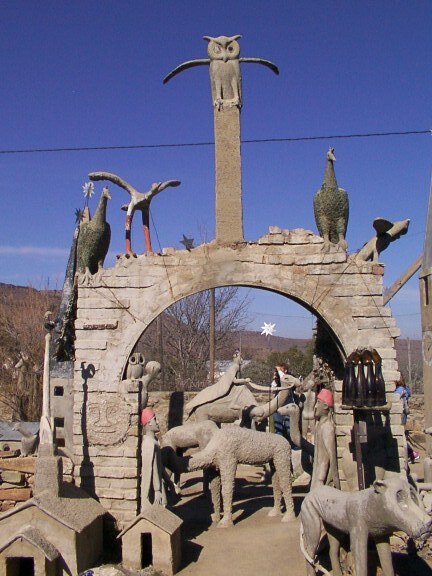 The play is based on the true story of an aging Afrikaaner woman, Helen Martins, whose evocative sculptures transformed the yard of her house in her isolated community into “a visionary environment”, assaulting the sensibilities of her conservative Dutch Reformed neighbors and causing them to doubt her sanity. Her home became known as “The Owl House” for her frequent depictions of owls in addition to a variety of human figures. The Mecca in the title does not have a religious implication but instead reflects Miss Helen’s fascination with the eastern culture that resulted in her having the statues all facing East. Fugard is best known for his plays dealing with the evils of apartheid, but here he brings together two social & political opposites from white South Africa who each consider themself Miss Helen’s friend and take a strong interest in her welfare according to their own conflicting views about artistic creativity & the challenges of aging. Fugard himself had a home in remote Nieu Bethesda, Miss Helen’s community, and loved the stark beauty of the Karoo desert setting. The play won the 1988 New York Drama Critics' Circle Award for Best Foreign Play and was hailed "[T]he author's most personal play to date, an essential Rosetta stone for the entire canon." - The New York Times. Silverthorne’s production is directed by Rebecca Daniels and features veteran actors Jeannine Haas as Miss Helen, Chris Devine as Pastor Marius, and Mo Mosley as Miss Helen’s young friend, Elsa.. A native of South Africa herself, Mosley speaks Afrikaans and will serve as dialect coach for the other actors. Former NMH instructor Ted Thornton serves as dramaturg, contextualizing for the cast and audience the nature of Afrikaaner culture in the 1970s setting of the play. The Company has engaged professional designer Molly Hall to create the magical environment of Miss Helen’s home that so expresses her unique artistic gift. Tickets for the play may be purchased online through Eventbrite.com or by calling the Silverthorne Box Office at 413-768-7514. Discounted tickets will be available as of June 1 at World Eye Bookstore in Greenfield and Broadside Books in Northampton. Performances are scheduled for June 21, 22, 23, 28, 29, 30 at 7:30 pm with a matinee on Sunday, June 24, at 2 pm. The fourth floor space at Hawks & Reed at 289 Main St, Greenfield, is air conditioned and fully handicapped accessible. Joey is in a hurry to “become a man,” but he’d prefer not to skip his weekly poker game for Friday night services to do it. 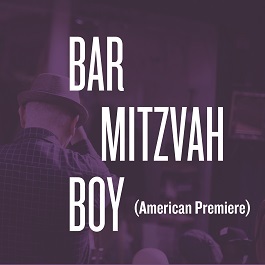 While this late-in-life Bar Mitzvah (and successful divorce attorney) is finding his spiritual way, the rabbi guiding him is losing hers. The 2017 Jewish Playwriting Prize winner is being directed by Guy Ben-Aharon, director of 2016’s hit production, Oh God. Berkshire favorite Tara Franklin (Sister Play) returns to play Rabbi Michael, and Boston veteran actor Will LeBow will make his CTC debut as Joey. 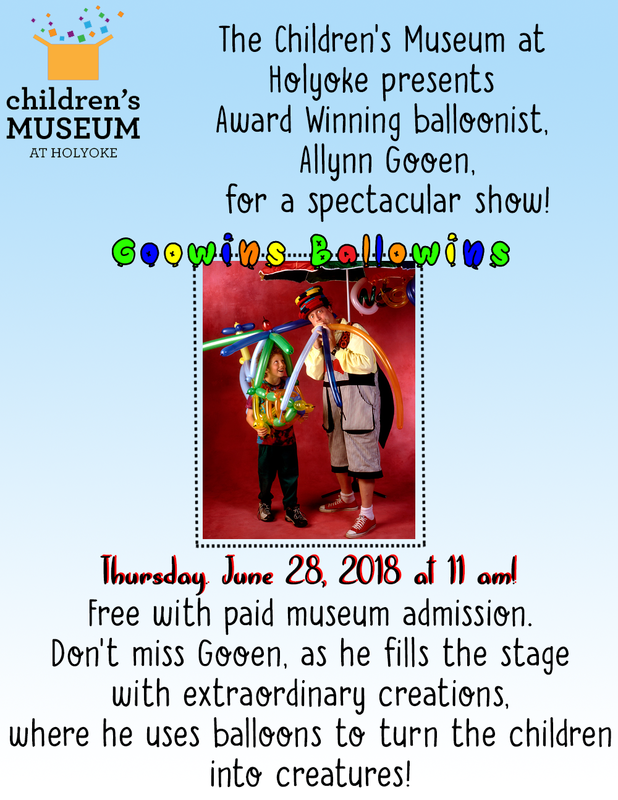 Celebrate the start of summer with madcap balloon artist, Allynn Gooen, at the Children's Museum at Holyoke! In this interactive performance, Gooen has the children become the characters and heroes of the stories, and the twisting of balloons creates the sets, props, and costumes in a fun and unique theatre of balloons. With a special focus on Dr. Seuss stories, this is an event your kids won't want to miss. 3 unique workshops as part of the 27th Annual KO FESTIVAL OF PERFORMANCE, held each summer on the beautiful Amherst College campus in Amherst, Massachusetts. Join us for one or more of our 6-day intensives, led by expert teachers, who are adept at gearing their classes for multiple levels of experience. 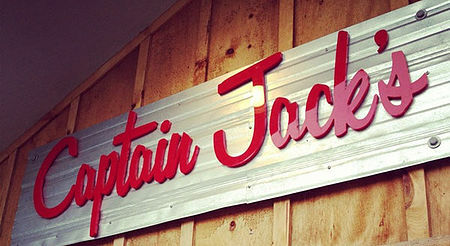 PaintBox Theatre presents our PreSeason Party at Captain Jack's in Easthampton, where you'll catch Tom McCabe telling stories, Lively Live music, and (thanks to our Season Sponsor: Royal Talens North America!) a lot of art to supplement the images needed for our summer season of TARZAN, PIRATES, and THE LITTLE MERMAID.